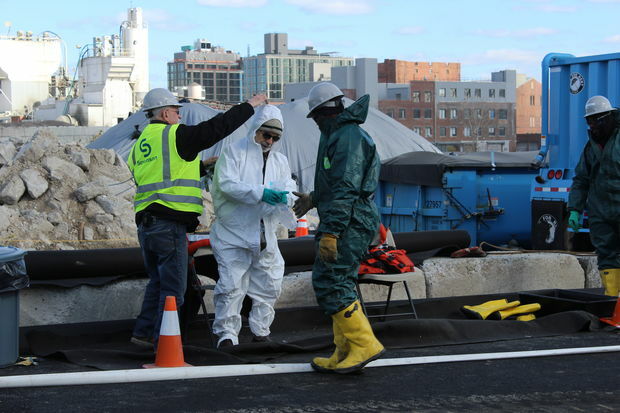 Christos Tsiamis, the EPA's remediation project manager for the Gowanus Canal, suited up in white hazmat gear to examine debris removed recently from the canal. The new buildings in the backbround are luxury rental apartments on the banks of the heavily polluted canal. GOWANUS — It's a disappointment for treasure hunters but good news for tree huggers. Contractors removing debris from the Gowanus Canal haven't found any archeological gems, but they've made important progress on the canal's $506 million cleanup, U.S. Environmental Protection Agency officials said Tuesday. "I know people were hoping to find the wreck of the Andrea Doria, but unfortunately it's just urban debris," the EPA's community involvement coordinator Natalie Loney said, referring to the infamous shipwreck favored by treasure divers. The recently completed debris removal project took pieces of old boats and trees out of the canal and uncovered exactly one big surprise: some "unexpected big boulders," said Christos Tsiamis, the EPA's remediation project manager. EPA's remediation project manager Christos Tsiamis showing visitors debris that was recently pulled from the Gowanus Canal. Tsiamis said the boulders' origin was a mystery, in part because of the polluted waterway's past neglect. "For decades, nobody was really paying attention to the canal. Now everybody is," Tsiamis said. In fact, interest in the much-abused canal is now so intense that Tsiamis and Loney led a tour Tuesday for visitors who wanted a peek at some of the debris removed from the canal over the past several weeks. After signing liability releases and listening to a safety briefing that included instructions on how to flee the site in the event of a sudden fire or chemical spill, the dozen or so visitors were allowed to observe the debris from a distance of several feet. The detritus had been plucked out of the canal by excavators on barges, then power-washed with water and laid out in a cordoned-off area called an "exclusion zone" on which only "qualified" workers (not the general public) were allowed to set foot. Debris on display Tuesday included a pile of smashed fiberglass that was once a boat, nests of twisted rusting metal, and several large tires. A couple of bus-sized mounds covered in black plastic lurked in the back of the roped-off viewing area. They were samples of the infamous sediment from the depths of the canal, known as "black mayonnaise." The sludgy sediment had been mixed with concrete and turned into solid chunks so it could be safely trucked away from the site, officials said. Constuction Manager Ron Prohaska said the toxin-laden sediment, which contains contaminants such as polychlorinated biphenyls, smelled like "decaying material" when it was first pulled out of the canal. When dredging starts next year, contractors will be tasked with removing some 587,000 cubic yards of the highly contaminated sediment. During the recent debris removal project, workers tested three different types of excavator buckets to see which one would work best for scooping up the toxic sludge next year, Tsiamis said. Excavators on barges will do the dredging throughout the canal, including in front of the newly opened 365 Bond luxury apartment building. The spot where EPA showed off the debris Tuesday is now a dusty vacant lot beneath the Smith-Ninth Street subway stop, but like many properties in Gowanus, there are big plans for its future. The city intends to one day build a 774-unit, eight-building residential development there where 70 percent of the apartments would be affordable. A luxury residential developer recently paid $50 million to buy the land right next door and may build a hotel there. Built in the 1860s, the manmade Gowanus Canal was used for decades as an aquatic trash can by the industrial businesses on its shores. Today, the EPA considers the 1.8-mile canal one of the most polluted waterways in the country and is now in the process of leading a Superfund cleanup there. There's still a chance contractors could uncover some historic artifacts during the canal's cleanup. The project will include digging out the long abandoned First Street turning basin, which could hold Revolutionary War-era battle remains — or just more tires. 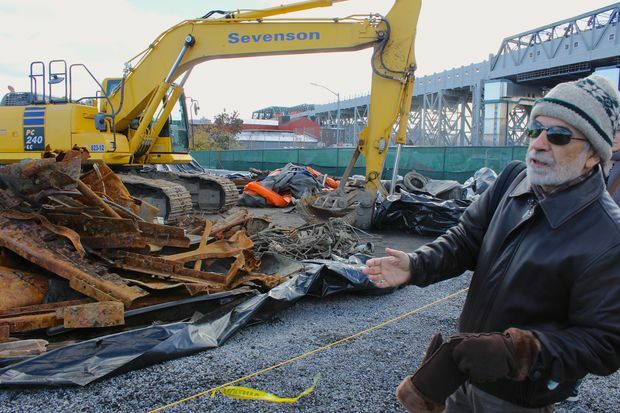 Although the recent debris removal didn't yield any amazing discoveries, local activist Linda Mariano of Friends and Residents of Greater Gowanus said she and other residents were glad to see progress on the long-awaited canal cleanup. "Even though [they didn't find anything] archeologically sensitive, it's very exciting," Mariano said. "It's very special for us."